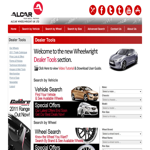 Alcar Wheelwrightâ€™s nationwide network of retailers will soon benefit from a new trader website set up by the company. Aiming to improve customer relations, and also to speed up business, the website will offer retailers a range of functions to improve both productivity and sales. Those retailers who register will be able to look up stock by vehicle, wheel, PCD or size. The system will then display all the corresponding components for that vehicle, not only in the UK, but also in the companyâ€™s warehouse in Germany. As well as placing stock orders, retailers also have access to a wide array of 2D or 3D wheel images to use on their own websites, helping to entice and inform customers. James Gray, marketing executive explained: â€œWe are really excited about the developments with the website. This will only enhance the relationship with our customers; weâ€™ve listened to their needs and developed a solution we are very pleased with. You can access the new website here.